Buried deep in 2012 budget legislation was a paragraph or two that prevents the federal government from spending any funds enforcing the 2007 light bulb efficiency standards/ traditional light bulb “ban” through the end of September 2012. 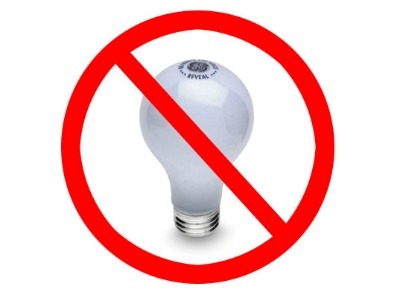 While this isn’t a technical repeal of the ban/efficiency standards, it will allow traditional 100 watt incandescent bulbs to continue to be sold through most of 2012 by those companies who aren’t put off by the negative public relations (green groups may well go on the offensive if national retailers continue to sell them) or potential legal liabilities. It isn’t clear yet the extent to which 100 watt traditional incandescent bulbs will be available for consumer purchase in 2012. The delay/temporary repeal of the ban has some on the left angry, as Tim Carney notes, though I suspect they’d be angrier if this budget rider had been swapped for delaying implementation of some of the more expensive 2011-2012 EPA regulations, which certainly seemed like a possibility. Big Business usually loves it when the GOP goes to war over federal rules. But not when it comes to light bulbs. This year, House Republicans made it a top priority to roll back regulations they say are too costly for business. Last week, the GOP won a long-fought battle to kill new energy efficiency rules for bulbs when House and Senate negotiators included a rider to block enforcement of the regulations in the $1 trillion-plus, year-end spending bill. The rider may have advanced GOP talking points about light bulb “freedom of choice,” but it didn’t win them many friends in the industry, who are more interested in their bottom line than political rhetoric. Big companies like General Electric, Philips and Osram Sylvania spent big bucks preparing for the standards, and the industry is fuming over the GOP bid to undercut them. After spending four years and millions of dollars prepping for the new rules, businesses say pulling the plug now could cost them. The National Electrical Manufacturers Association has waged a lobbying campaign for more than a year to persuade the GOP to abandon the effort. Manufacturers are worried that the rider will undermine companies’ investments and “allow potential bad actors to sell inefficient light bulbs in the United States without any fear of federal enforcement,” said Kyle Pitsor, the trade group’s vice president of government relations. As most of us know, a non-minority of conservatives in Congress will give lip service towards free markets when their constituents want to hear it (when we’re condemning Solyndra, etc.) but then turn around and quietly support all sorts of corporate welfare. Consider the fight over T. Boone Picken’s Natural Gas Act as an example. On the other hand, I confess that the unanimous support for these standards from the lighting industry gives me pause. Industries only support laws that will improve their profitability in one way or another, so I assume that this law does exactly that. This is, obviously, not inherently good for consumers. It’s widely known that General Electric, et. all lobbied heavily for this as it would increase their profitability. The new bulbs are more expensive up-front, meaning a large initial profit for producers, with consumers making up the savings in energy efficiency over time. This assumes the bulbs last as long as predicted, which so far has not been the case with compact fluorescent bulbs. One good argument that the industry people quoted in the Politico piece make is that changing the rules after they’ve been implemented is bad for the economy, as some of these investments might not pay off if consumers continue to buy the old bulbs. Though this is a case against repealing the legislation, its also a case against passing similar legislation (in the first place) in the future if its wildly unpopular and may be overturned in the future. Finally, it should reduce our confidence in industry’s assertion that the new bulbs are better and will be preferred by consumers. It’s clear that many consumers object to the light given off by CFLs, and it remains to be seen if the new energy-efficient incandescents will be widely adopted by consumers. Assuming they provide similar lighting and save energy, I see no reason why consumers wouldn’t slowly begin to purchase them voluntarily. I love my LED’s. The color is very nice and I’ve already seen a difference in my energy costs since I switched over. I found really great prices at Earthled.com. The new light bulbs do not last as long as touted. For example, I paid 15$ a bulb for very long lasting outdoor track light where I had to hire a maintenance guy to put them at the top of a third story building. The new bulbs were supposed to last for years. They blew out in 6 months of only part-time nighttime use. Furthermore, they put out poor light. I simply do not like the new bulbs. I hate to wait for them to give off light slowly as they warm up (at least some of the new bulbs act that way). I far prefer the incandescent bulbs. Why should I have to give up a product to help lower global temperature, when 1.) I do not think there is global warming. 2.) I wish there was global warming because plants grow better when there is warm weather (check out the equator) 3.) it will not bother me one little bit if people living along the oceans have to move their cities inland as it would make jobs 4.) I am absolutely sick of being told what to do by wacko socialistic/environmentalists. I have a question about lightbulbs. Do CFL’s really use less energy than traditional lightbulbs. I think that the real savings occurs in applications where lights are left on all the time in certain commercial and industrial applications. CFL’s are heavily subsidized. How much would they cost if we had to purchase them without the subsidies? How much energy do they waste in production and transportation from China to the United States? Wouldn’t a light source that was local use less energy? What is the total life-cycle cost of CFL’s compared to “traditional” bulbs? Global Warming Theorists believe that greenhouse gasses are responsible for increased levels of CO2 right? Does that mean that they all compost 100% of their compostable waste including all their kitchen waste? Did you know that when this kind of waste goes to the landfill, not only do trucks have to burn fosil fules to drive their waste to the landfill, the waste breaks down in the abscence of oxygen. This is what is called Anaerobic Composting. It produces noxious greenhouse gasses. If people really believe in man-made global warming then they would compost their kitchen scraps. Wouldn’t they? And they would walk to the farmer’s market or neighborhood urban farm to buy their food instead of driving the fosil fule mobiel to the grocery store with all those electric lights powered by power plants filled with food grown and produced up to five-thousand miles away and shipped into town in big gas guzzling trucks. Maybe they would plant a garden, make their own food without fosil fules of any kind and feed the little old laddy down the street and the kids next door who only eat the degraded food that WIC affords them. When you get your hands dirty and grow your own food you do the most revolutionary thing anyone can imagine: change your self.